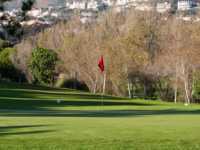 If youre looking for San Clemente golf deals that combine a challenging course with breathtaking scenery, then Shorecliffs Golf Club is the place to be. Shorecliffs is a Joe Williams designed course that may not be the longest around at 6,244 yards, but rewards accuracy rather than length. Opened in 1964, Shorecliffs is a par 71 layout with a 70.4 rating and 130 slope. The course makes perfect use of its natural surroundings, with bunkers and water hazards blending in effortlessly with towering trees, hills, valleys, and a wonderful view of the ocean. San Clemente tee times are easy to come by and affordable thanks to year-round Shorecliffs Golf Course discounts. Twilight and super twilight fees on weekdays and weekends compliment regular daily rates. There are also frequent player cards and monthly fun passes available, along with other specials. The pro shop at Shorecliffs is fully stocked with everything you need for a day on the course, including great deals on new or previously played balls. There is also a driving range with mats and natural grass tees along with a practice area with a bunker and putting green. Shorecliffs Golf Course is a great destination for a party or special occasion. The restaurant offers a wide variety of menu options while the floor is spacious enough for music and dancing.